Dermoscopy is a method of growing significance in the diagnoses of dermatological pigmented skin diseases. However, in my case, mycology culture was negative and successful treatment was given on the basis of trichoscopy and wood lamp examination. I hereby describe a young boy with tinea capitis, multiple “comma hairs” and “zigzag hair” and a subtle additional feature “Morse code-like hair” when intensification was applied. Dermatoscopic aspects found skin Type 2 in a child of as a distinctive dermoscopic finding. Dermoscopy is mainly used to examine pigmented skin lesions; however, recently, it has been expanded and utilized extensively in dermatology for the identification of different structures and colors not seen by the naked eye. Recently, many studies have been published showing the effectiveness of this equipment in the assessment of hair and scalp disarrays. Trichoscopy offers a rapid and noninvasive tool to identify and explore more details of patchy hair loss. The diagnosis of erratic hair loss in children is often a matter of substantial dispute among dermatologists. Tinea capitis (TC), a dermatophyte infection of the scalp and a highly contagious infection, is still realistically frequent in everyday dermatology setups and is prevalent in the age group between 3 and 7 years. Several synonyms are employed, including ringworm of the scalp and tinea tonsurans. TC has diverse causative agents and can exhibit with one or multiple foci of alopecia, with or without tonsure. The readings of a specific dermoscopic finding can lead to a straightforward diagnosis. Trichoscopy refers to the evaluation of hair and scalp disorders using a dermoscope. It was coined by Haliasos et al. and Olszewska in 2006., It is a noninvasive, speedy, simple, handy, cost-effective method that allows a rapid and magnified in vivo inspection of the skin with the revelation of morphologic attributes often imperceptible to the naked eye. It can be performed with manual devices which usually have ×10 magnifications. 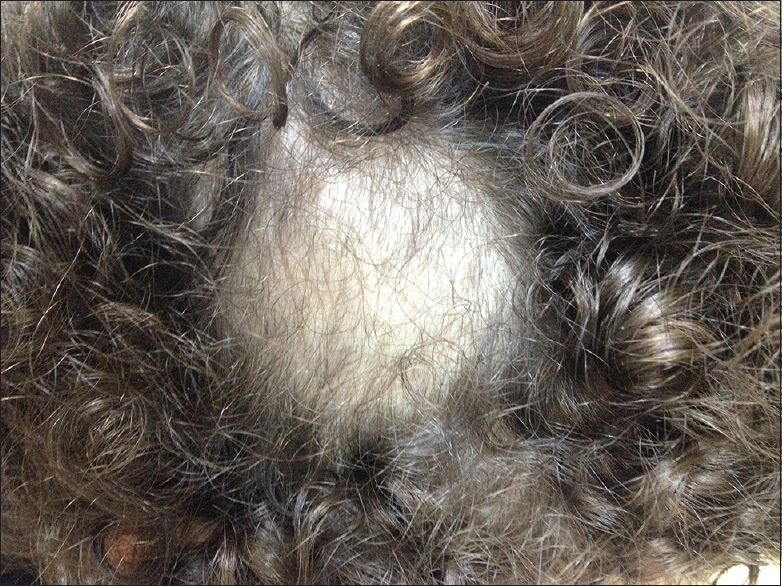 A 6-year-old, healthy, white boy with long wavy light brown hairs, presented with an intense itchy, painless scaly patch of hair loss in the right parietal region of the scalp, in the past few weeks. The young boy was Libyan and he had frequent contact with wild cats. Physical examination exposed a single rounded plaque of hair loss with white scale on the right parietal scalp area with no erythematous background [Figure 1]. There were no palpable lymph nodes in the lateral cervical chains. TC was diagnosed with confidence clinically that comes from accumulated experience. The glass plate of a Handheld Dermlite II Pro dermatoscope examination at 10-fold magnification (low- and high-magnification) was employed with alcohol as the interface medium and the most characteristic findings observed were multiple broken hairs and hairs with a characteristic comma-like shape which is called as comma hairs, pigtail and zigzag hairs, and some corkscrew hairs [Figure 2]. Furthermore, a newly described finding was scarcely seen called “Morse code-like hair” was seen [Figure 3]. The Woods lamp examination yielded a characteristic fluorescence of lighter yellowish-green [Figure 4]. The patient was administered oral griseofulvin (fulcin syrup) with fatty meals for four consecutive weeks and was followed up after 3 weeks. The dose was calculated according to his body weight. Follow-up showed that the lesions had cleared completely, and there was no evidence of residual scarring alopecia. In addition, the causative dermatophyte was not identified in my case. TC is a common scalp infection in children and is caused by a range of dermatophyte species of the genera Trichophyton tonsurans and Microsporum with a pervasiveness of roughly 1% in developed countries. The condition should be projected in any patient with a solitary or numerous diminutive plaques of hair loss that are associated by cut hairs, scales, and itching. The differential diagnosis of hair loss in children should comprise mostly TC and alopecia areata. Slowinska et al. avowed that comma hair is a distinguishing marker for TC followed by broken and black dots (dystrophic hair). Comma hair, corkscrew hair, and pigtail hair were all observed only in patients of TC, thus forming specific features. Comma hairs - a dermatoscopic emblem of TC is shaped doubtless due to hair shafts that have disintegrated, cracked, and bent due to the occurrence of multiple hyphae within the hair shaft;, they have an even thickness and color and marked distal angulations. 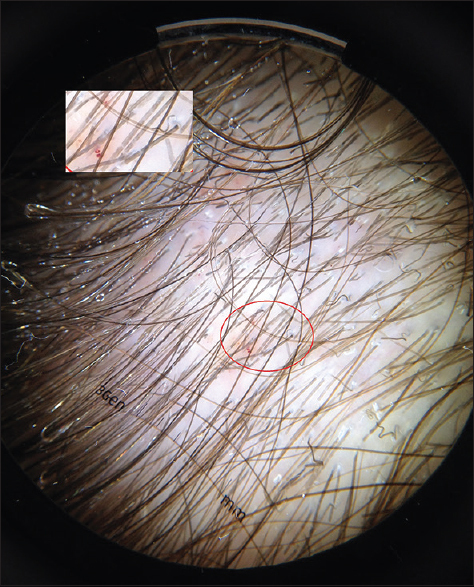 Corkscrew hairs were recently proposed as a new trichoscopy indicator of TC. Hughes argued a specific finding in blacks with TC and declared that comma hair and corkscrew are the chief trichoscopic findings. He also illustrated the presence of dystrophic and broken hair, and the main fungi found were Trichophyton soudanense, Trichophyton violaceum, and Microsporum langeronii. He pointed out that corkscrew hair is a variant of comma hair in black patients and is a marker for endothrix TC. Corkscrew hairs were former examined by Hughes in black patients with T. soudanense. Whereas conversely, Isa has argued the specificity of such findings and acknowledged that corkscrew hairs are not explicit to T. soudanense as they can be found in other species of Trichophyton and Microsporum, and he proposed it was probably a variation in black populations. He also added that it is his new discovery and pioneering of white sheaths around the proximal shafts as a feature to TC. My patient was, however, white and the main findings were numerous zigzag hairs. Recently, a new trichoscopic feature surfaced up with grand magnification application which is not clearly visible at low magnifications. At lower magnification, it showed subtle horizontal white bands (interrupted) and appeared as empty bands at higher magnification. It is called Morse code-like hairs (bar code-like hairs). This feature coincides with the horizontal white bands, so the infected hair appears as empty bands which are related to localized areas of fungal infection. These horizontal white bands are usually multiple and may cause the hair to bend and break according to Lacarrubba et al. observation. They are translucent, easily deformable hairs that look weakened and transparent and show unusual bends due to hair shaft invasion. It denotes that the whole hair shaft follicle is heavily infected by fungus as Lin and Li confirmed. In this case, few subtle Morse code-like hairs can be appreciated by further manual intensification [Figure 3]. Direct examination with 10%–20% KOH is, however, a golden standard to make a diagnosis of TC as it is an easy and nonexpensive tool. Cultures cannot regularly be performed though it is the golden standard as well as the state of art to diagnosis TC. However, in this case, it came out as negative. Nonetheless, both direct KOH observation and mycological culture of skin scrapings consume time and money which would delay the commencement of treatment and thus contiguous risk. Therefore, simple, direct, and rapid methods are desirable to make a quick diagnosis and start treatment - the trichoscopy. Trichoscopy of the hair and scalp may therefore be a very useful diagnostic tool in this setting since it is quick, reliable, inexpensive, and noninvasive. Trichoscopy offers a sensitive tool for quick diagnosis and is effective in monitoring treatment evolution. In fact, trichoscopy can facilitate the diagnosis since it is a fast, reliable, noninvasive, and inexpensive tool. Normalization of trichoscopy is a good prognostic sign for recovery in TC, but it would not imply a manifestation of full successful recovery until a full dose of treatment is compiled for 6–8 weeks. The continuum of trichoscopy has received considerable interest in the last decade. Its use in hair and scalp disorders has been only used recently and appreciated. Trichoscopy improves diagnostic accuracy and may contribute in understanding the pathogenesis of hair disorders. 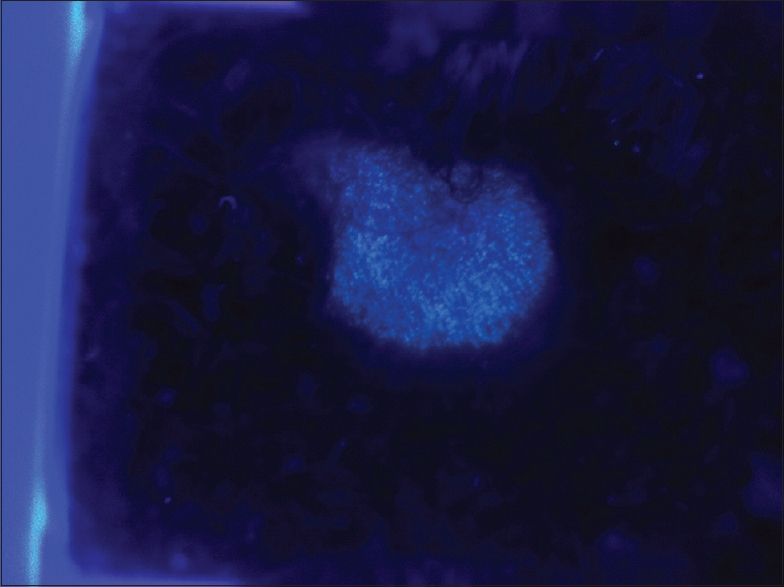 It thus may serve as an important diagnostic connecting tool between clinical diagnosis and histopathology. Further study is requisite to illustrate that the presence of the newly described feature “bar/Morse code-like hairs” as an additional reliable finding of fungal infection of the hair follicles to back up the allege. The limitations of trichoscopy must be acknowledged in this case as no mycological study was in hand to confirm the main culprit. I have described a unique case of TC with abundant zigzag hairs, with some comma, corkscrew, pigtail, and subtle Morse code-like hairs, a possible dermatoscopic marker of this condition. I consider that trichoscopy as an effective, quick, cheap, and noninvasive tool that can aid in the diagnosis of TC swiftly. Pinheiro AM, Lobato LA, Varella TC. Dermoscopy findings in tinea capitis: Case report and literature review. An Bras Dermatol 2012;87:313-4. Haliasos EC, Kerner M, Jaimes-Lopez N, Rudnicka L, Zalaudek I, Malvehy J, et al. Dermoscopy for the pediatric dermatologist part I: Dermoscopy of pediatric infectious and inflammatory skin lesions and hair disorders. Pediatr Dermatol 2013;30:163-71. Slowinska M, Rudnicka L, Schwartz RA, Kowalska-Oledzka E, Rakowska A, Sicinska J, et al. Comma hairs: A dermatoscopic marker for tinea capitis: A rapid diagnostic method. J Am Acad Dermatol 2008;59 5 Suppl: S77-9. Nikam VV, Mehta HH. 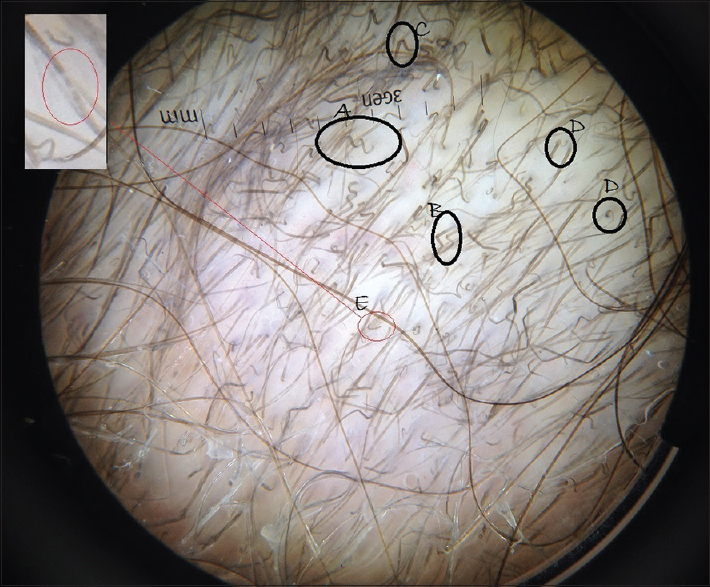 A nonrandomized study of trichoscopy patterns using nonpolarized (contact) and polarized (noncontact) dermatoscopy in hair and shaft disorders. Int J Trichology 2014;6:54-62. Hernández-Bel P, Malvehy J, Crocker A, Sánchez-Carazo JL, Febrer I, Alegre V. Comma hairs: A new dermoscopic marker for tinea capitis. Actas Dermosifiliogr 2012;103:836-7. Isa R, Amaya B, Pimentel M, Arenas R, Tosti A, Cruz A. Dermoscopy in tinea capitis: A prospective study on 43 patients. Med Cutan Iber Lat Am 2014;42:18-22. Hughes R, Chiaverini C, Bahadoran P, Lacour J-P. Corkscrew hair: A new dermoscopic sign for diagnosis of tinea capitis in black children. Arch Dermatol 2011;147:355-6. Lacarrubba F, Verzì AE, Micali G. Newly described features resulting from high-magnification dermoscopy of tinea capitis. JAMA Dermatol 2015;151:308-10. Lin Y, Li Y. The dermoscopic comma, zigzag, and bar code-like hairs: Markers of fungal infection of the hair follicles. Dermatol Sin 2014;32:160-3.